Etosha National Park is without a doubt one of the best value safaris in Southern Africa. The park offers some of the best game viewing in Southern Africa. 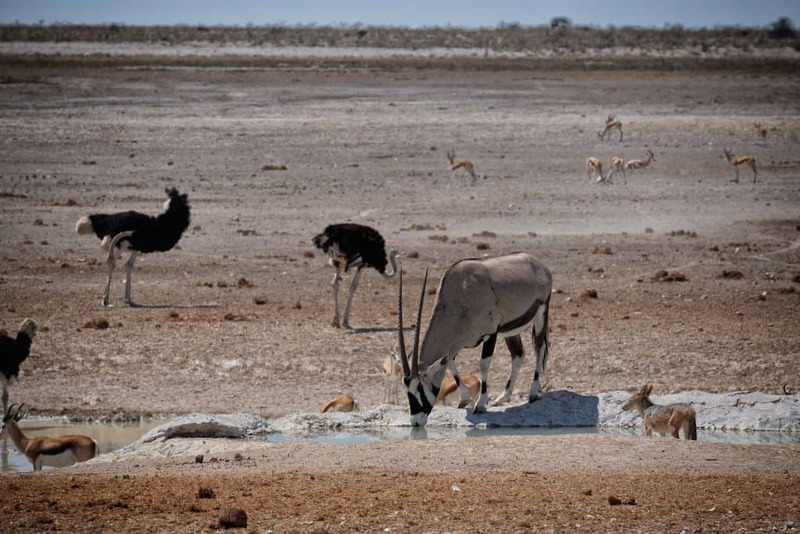 However, it does come at a price as barren Etosha is far from the most beautiful national park. 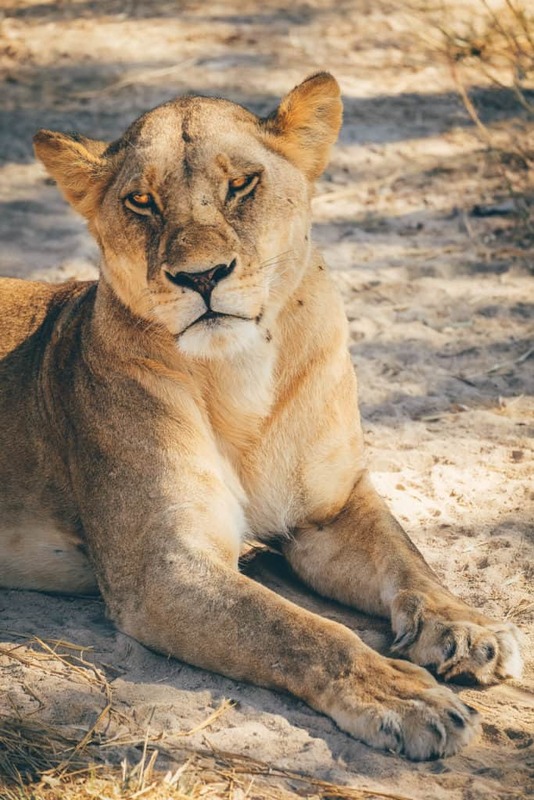 Despite this, the Etosha National Park is considered one of the best places to go on Safari in Southern Africa and for good reason. The lack of water in the area is also its saving grace as animals are concentrated at watering holes. The quality of roads, lack of huge crowds, and general ease of traveling Namibia are big pluses as well. 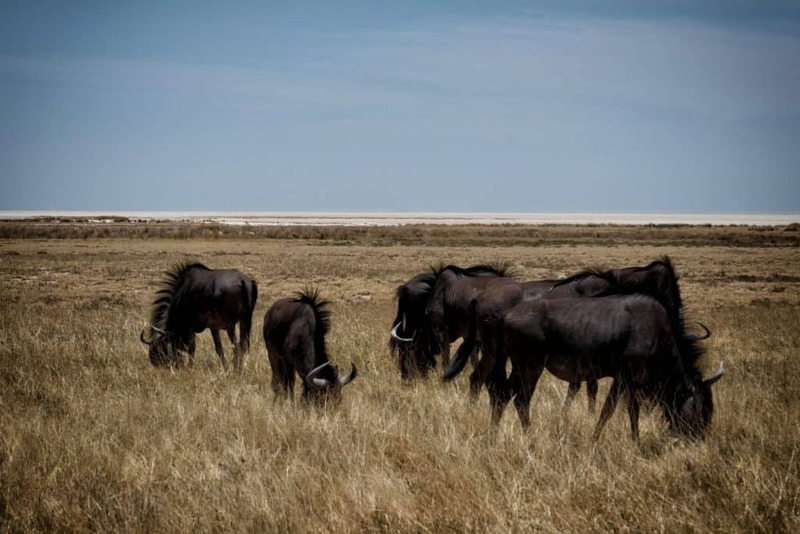 With a small selection of lodges, Etosha never gets too crowded. 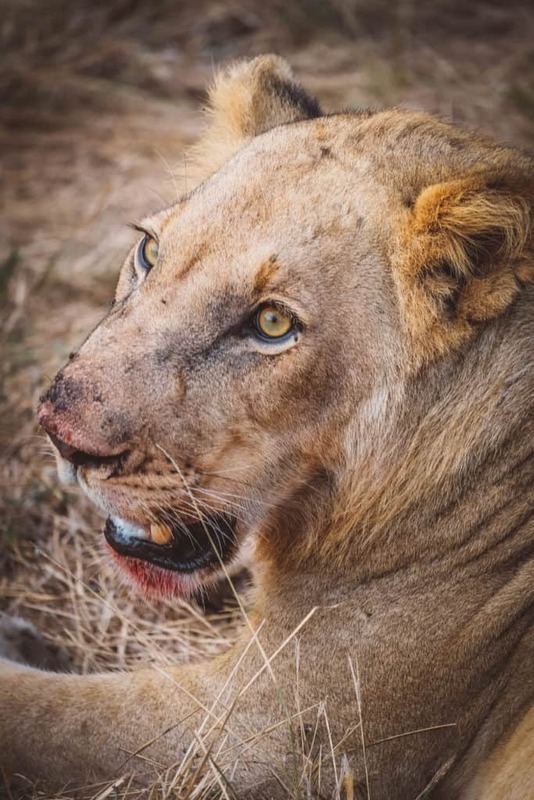 Even with our best animal sighting we only saw three other cars, and that was a lion kill with hyenas, jackals, and vultures circling around waiting to get some dinner. In neighboring South Africa and in Kruger there could be 50 cars. All of the parks in Namibia have the same pricing structure. The parks are also the cheapest we found in all of Africa for foreigners and are fairly well maintained. All park fees are payable at the gate at time of entrance. Park fees are valid for 24 hours. NWR regulates all national parks in Namibia. Opening times for the park vary based on the sunrise and sunset. It is a safe assumption to plan on a half hour before sunset or sunrise for both entering and exiting. When entering the park all gates have the exact opening and closing times displayed. Of course, asking when entering certainly won’t hurt. Exiting out of National Parks will generally resuls in some heavy fines and a strong talking to by the rangers. There are four entrance gates to Etosha. The two main gates to the park are Anderson’s Gate and Von Lindequest Gate. However, there are four gates visitors can enter into Etosha National Park. Anderson Gate – Southern Gate – This is the main entrance into Etosha and there are a number of safari camps near the entrance for those not looking to stay in the park. The C38 a good paved road leads to the gate. Von Lindequest Gate – Eastern Gate – This is the second largest gate to Etosha connected by a main road (the B1). Galton Gate – Western Gate -This is the most remote entrance to the park and is great for those traveling from Damaraland or the Skeleton Coast. King Nehale Lya Mpingana Gate – Northern Gate – Not far from the main town of Ondangwa. The word Etosha is taken from the indigenous language of Ovambo means great white place, referring the salt pan that dominates the park. Due to alkalinity and aridness of the pan almost no plants grow here, aside from a few grasses and trees. The majority of landscape in the national park is Savannah Woodland. Mopane is the main tree and it is estimated that it makes up 80% of the forested area in Etosha. Other trees that can be found are the acacia and tamboti. The salt pan is the largest in Africa and covers nearly a quarter of the total park size. At 4,800km² of land the pan is even visible from space. 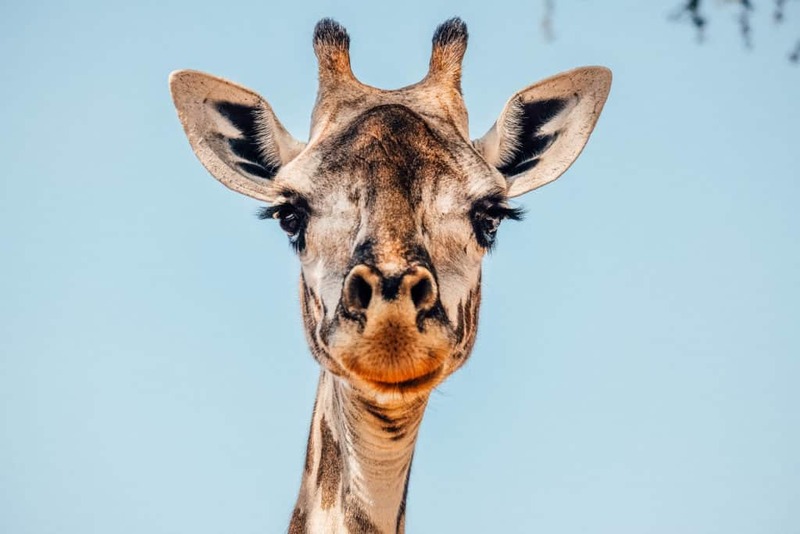 The park has a large population of wildlife and has around 114 different mammals that visitors have a chance to spot on their safari. It is also home to four of the big five animals, only excluding the African Buffalo. Water is scarce in the park. However, there are a large number of water holes both natural and manmade that provide water for the wildlife. These concentrated sources of water create great game density as animals all come to the sources of water. The water holes bring in large herds of elephant, springbok, oryx, zebra, eland, kudu, and even lonely black rhinos. Smaller wildlife that can be found around Etosha include jackals, honey badgers, mongoose, and the bat-eared fox. The road network in Etosha is a series of graded gravel roads. 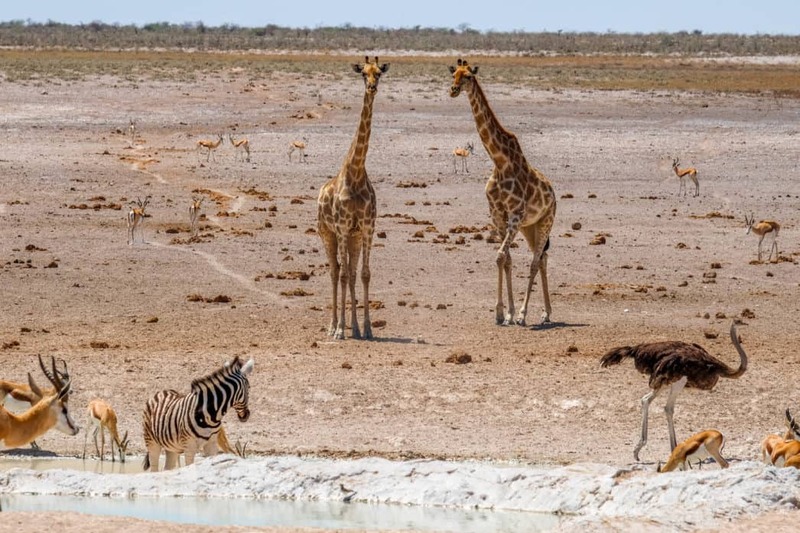 The network in Etosha does a good job at connecting to the main waterholes in the park and can even be driven with a sedan, although that is not advised. 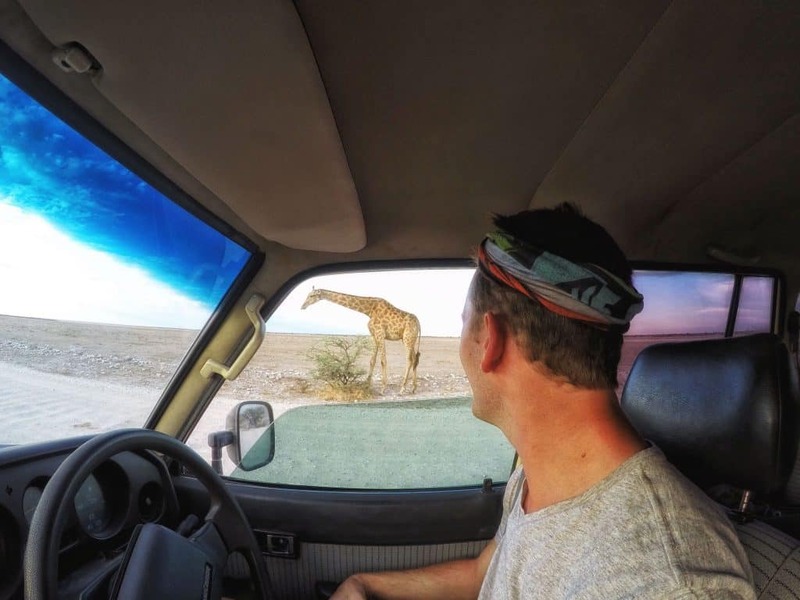 There are two recommended ways to experience Etosha. The most common is a game drive provided by a lodge, safari operator, or the parks department from one of their many camps in the park. This is the best option for most. Packaged game drives come with a knowledgeable guide who is well connected to the bush network and usually shares information with other guides on the ground. When one guide spots a lion kill he can then radio or call his buddies so they can take their guests to the sighting as well. The next option is to self-drive in a high suspension vehicle. Given the prevalence and popularity of road trips in Namibia a self-drive is a great option. The roads are well marked, easy to navigate, and well maintained making Etosha one of the easiest parks in Africa to overland yourself. This can vary a lot depending on the season, time of day, and even the year. Remember, the wild animals are wild, so therefore unpredictable. Okaukuejo is always a hit with visitors with its proximity to the rest camp. The watering hole is lit by floodlights throughout the night which provides visitors a chance to watch nocturnal animals come for a drink of water. Some of Africa’s most famous scenes have unfurled here including lion, elephants, hyenas, and rhinos squaring off as they compete for water. Other great viewing success can be had at Homob, Kelin Namutoni, Okundeka, Chudop, and Rietfontein. 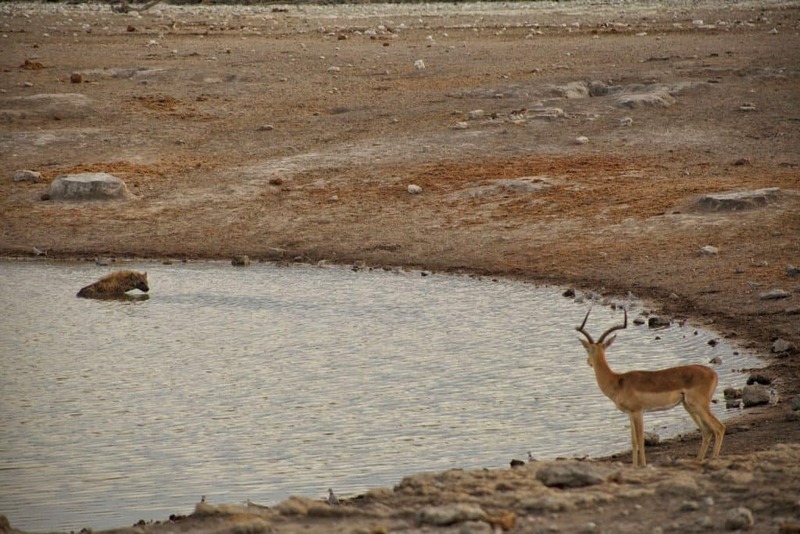 One of the best ways to view wildlife in Etosha is to simply sit at a watering hole and wait patiently. Due to the scarcity of water the animals will end up coming to drink. 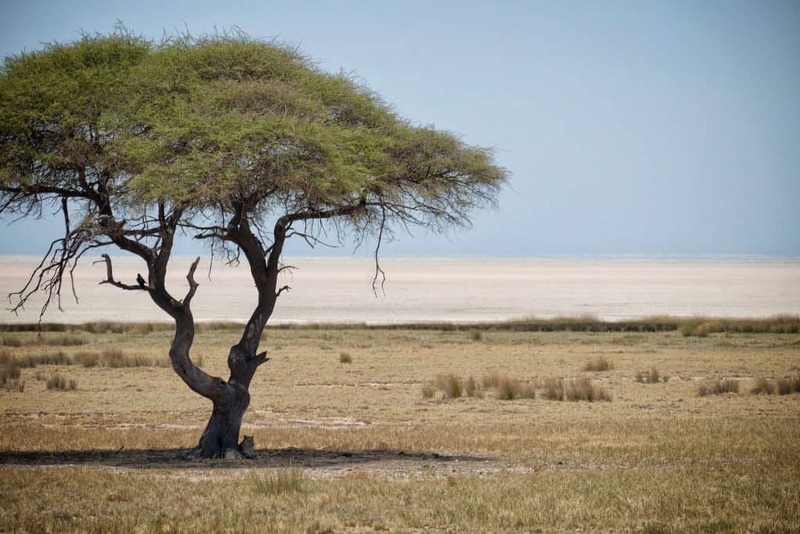 The best time to visit Etosha is in the dry season. The temperatures are cooler and the animals are more densely populated. This allows for the best wildlife viewing. The dry season is from May to October and is winter in Namibia. 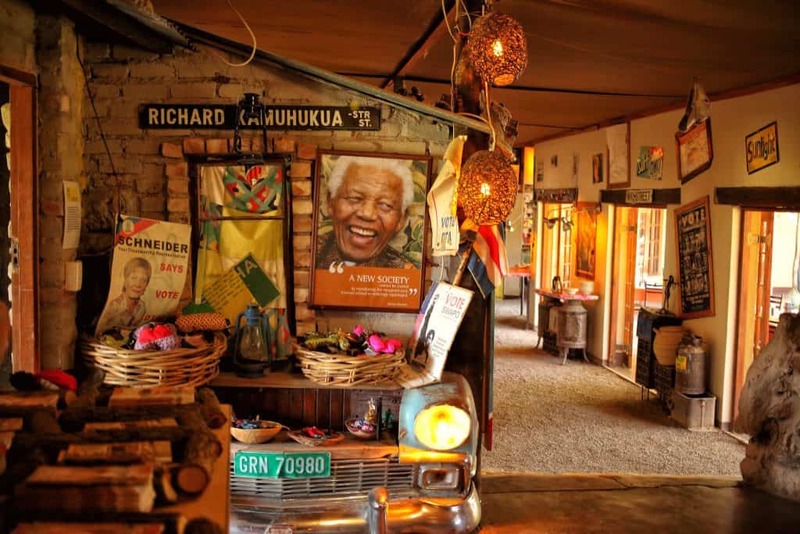 Popular camps and lodges are often fully booked up during this time, so book in advance or go with a tour operator who already has spots on hold. Summer (or the rainy season) can be a scorcher. When we were there in November temperatures were 40C+ and they average around 35C. However, once the rains reach the pan and the park everything is transformed to green. A dry dusty environment turns lush and bountiful. The pan can also gather a small amount of water and turn into a shimmering lake that attracts wetland birds including flamingos. It is estimated that almost one million flamingos can arrive in Etosha in order to breed in the pan. When packing for the park it’s a good idea to have a nice mix of safari clothes. The temperature can vary greatly going from freezing cold in the morning to scorching hot in the afternoon and then back down at night. There is a wide, but limited range of accommodation around Etosha National Park. There are a number of high end lodges with private concessions outside of the park. We found many great accommodation options in the south near the Anderson Gate and to the East at the Von Lindequest Gate. We stayed at Gondwana’s Etosha Safari Camp and Lodge. We had a fantastic time at both lodges in Northern Namibia and find them to be a great value, plus they have some awesome food! There is a nice selection of camps to explore Etosha National Park. The selection may not be as vast The Kruger in South Africa, however, the main camps within the park are all regulated by the parks department. They have pools, good facilities, watering holes for night viewing, and okay restaurants. We were a little disappointed by the parks department facilities, but they’re up to par for anyone looking for a more budget-friendly option, and wanting to stay in the park. 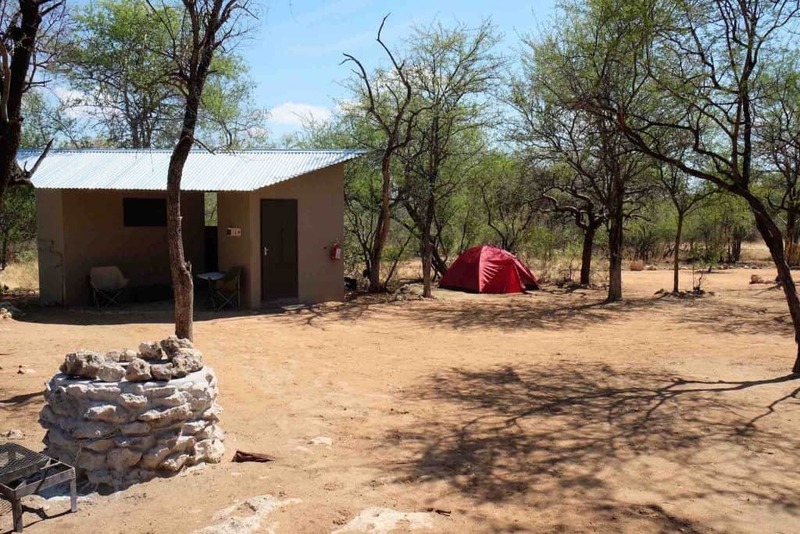 We can recommend three camps outside of Etosha. The first being Gondwana Collection’s Etosha Safari Camp that is located to the south near the Anderson Gate. The second being Onguma’s Tamboti Luxury Campsite which still ranks as the best campsite we’ve stayed in all of Africa. The third is Hobias Campsite in Damaraland to the west of the park. I’ve collected this map of Etosha from the NWR site that should help put the park into perspective. We always like to pick up a map at the gates of the national parks upon arrival. With Namibia’s growing popularity many travelers are making it their first trip to Africa. While the country is easy enough to navigate it is a vast desert country with gravel roads and sometimes limited facilities. Tours around Namibia and to Etosha National Park are super easy to plan and book. Tours to Etosha and Namibia also come in at all price points. You have budget overland tours and budget safaris that will drive guests around, provide meals, book campsites, and provide a guide. We think Tour Radar is a great way to compare and book tours anywhere in the world. 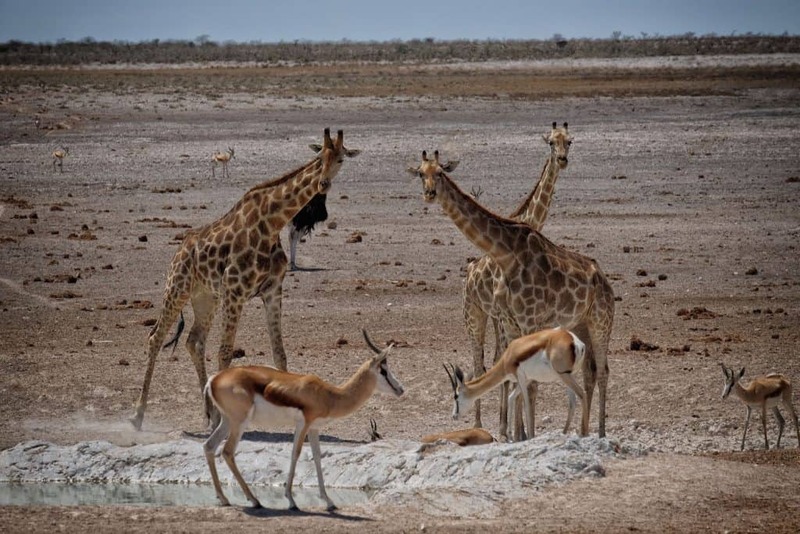 You can explore some tours that include Etosha National Park in their itinerary here. Personally, and a lot of Africans will back us up on this, people take malaria a little too drastically sometimes. Etosha is mostly a desert environment and dominated by a salt pan. 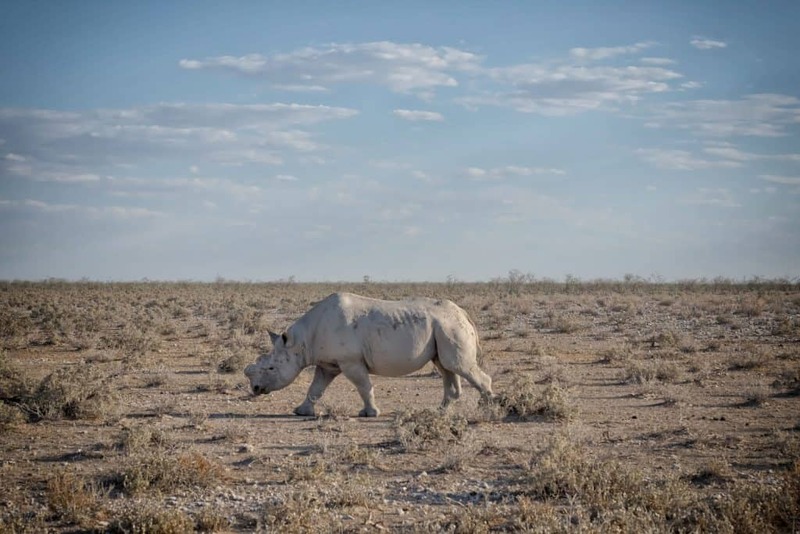 We did not take antimalarials when around Etosha, but if you are a worrier we would recommend putting your mind at ease and taking doxycycline. That being said at the onset of the rainy season mosquitos may be present. The best defense to malaria is to simply not get bitten. That means wearing insect repellant and long sleeves at night when the mosquitos carrying malaria can bite.